This is an expertly matched package consisting of the Goldring 1042 MM phono cartridge and Graham Slee Gram Amp 2 Communicator phono stage. 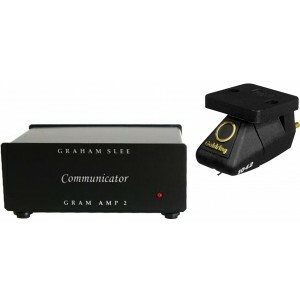 Graham Slee 2 Communicator sets a benchmark for budget phono stage performance, designed for MM or high output MC cartridges (of 2mV to 8mV nominal output). This phono stage is an excellent upgrade over the standard 'Phono' or 'Disc' turntable input on most amplifiers which is often just a cheap PCB and offers a more significant upgrade than rivals in its range. For more information on the phono stage, please visit our main Gram Amp 2 page. For more information on the cartridge, please visit our main Goldring 1042 MM page.